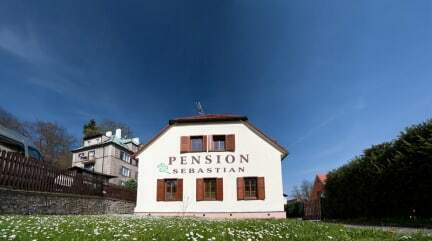 Our cozy guesthouse Sebastian is located only about 7 minutes slow pace walk from the historic center of Cesky Krumlov. All rooms have ensuite bathrooms, WiFi,TV+SAT and a minibar. A tasty breakfast is included. We also have a private parking, garden with gazebo & barbecue. Free pick up from the bus or the train station on your arrival. Welcome! Please note that we do not accept any group bookings (9 and more people) online. Our well established and reputable SHUTTLE bus service from CESKY KRUMLOV to LINZ, VIENNA, SALZBURG & HALLSTATT (Austria) is your best bet in getting safely and comfortably to your destination. Regular departures from Cesky Krumlov a few times a day starting at 9 00 am. Individual pick up times and places also possible. Would you like to see what our southern Bohemia region has to offer other than our amazing Cesky Krumlov? Do you want to hike through the typical Southbohemian nature while watching beautiful ruins of a medieval castle, visit some others, monastries, watch the true story behind the real BUDWEISER BIER on a 3D exposition in the brewery itself, or just go up in a chairlift to enjoy the views from one of the oldest stone watchtowers in Czech, the watchtower in Klet (1084 m)? Real Czech experinece! You will love it!